Here’s something you don’t see everyday – a 3D printer that actually prints physical objects. 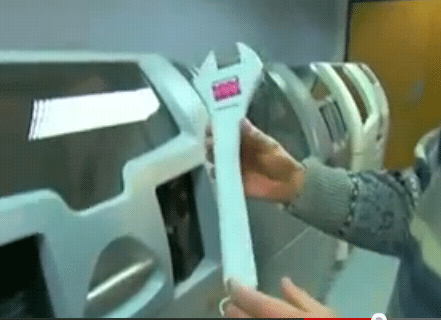 For example, in the video below you’ll watch a standard wrench get printed, in 3D, and it actually can be used as a tool. Completely real. That ZPrinter uses powder to print. Everytime it adds a new layer of powder and the special jets containing glue, antiglue, and colors prints that layer on the neccesary places. That hundreds of times, and there it is. You only have to remove the unused powder, and clean it. You can imagine printing a lot of slices of something on 2d paper, cutting the image out, and then gluing all images on top of each other so you get something thick. Also, there are more manyfactors of 3D printers. But ZCorp is without any doubt the best. ZPrinters use powder, so any unused material can be directly re-used. I also saw some desktop printer from another company, which used some sort of plasticfoil. It glued some layers ontop of each other, then cutting the model out. You had to remove a lot of plastic from the model, and the unused plastic was wasted and had to be recycled. So that’s another way, and I’m sure there are other sorts of 3D printers out there. Just bear in mind those things aren’t cheap. Quality, so ZPrinters, are starting from 15.000 dollars. But that gives no color. The ZPrinter in that video is the best of all, and worth around 60.000 dollars. I’ve heard there are aldo printers under 5.000 dollars, but the quality is most likely bad then.